It is Lavender season, many festivals in honor of this universally healing herb take place at this time of year. The word lavender comes from the Latin "Lavare" meaning to wash. The herb has a very rich presence in literature and is used widely in medicinal preparations, culinary delights and cosmetic preparations. The essential oil of lavender is derived from the distillation of the flowering tops of Lavandula officinalis, also referred to as Lavandula angustifolia/vera. Lavender essential oil has analgesic properties. Apply a cool compress the forehead to bring some relief from a headache. Place 5 drops of lavender essential oil into two cups of cool water. Place a wash cloth on the top of the water to soak up essential oil and water. Wring out and apply to forehead, avoiding the eyes. Re-apply as needed. Lavender essential oil has calmative and hypotensive properties. Place a drop of lavender essential oil on your pillow case to help you sleep at night or on a cotton ball during stress filled situations. Add 8 drops to warm bath water at night for a relaxation before bedtime. Lavender essential oil has anti-inflammatory properties. Apply to wounds either neat or with a cool compress. The magickal properties of Lavender are derived from its association with the planet Mercury and elemental air. Use it when intending clarity of the mind. 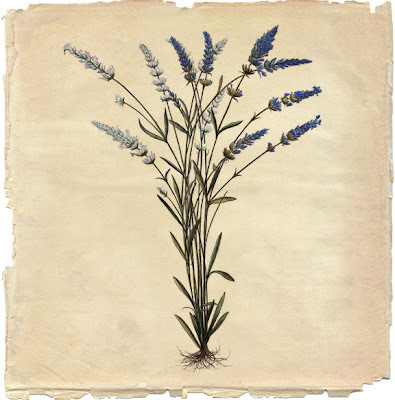 References also site lavender in connection with attracting prosperity, love and the elemental Faes due to its attractive scent. Lavender is often utilized as an offering in Mid-Summer celebrations. The main reoccurring theme we find associated with lavender in mind, body and spirit is PEACE. Peace of mind, peace from physical distress...peace, peace, peace. and fall in love whenever you can. In perfume lavender essential oil tends to be classified as a top to middle note. Where as the absolute is considered a base note. In perfume we find the lavender note used in Lavender Eau de Colognes and the category of fragrance deemed Fougere, meaning fern in French. 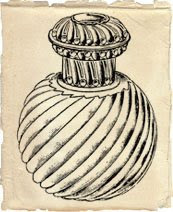 Fougere perfumes feature the combination of oakmoss with lavender. As a botanical and natural perfumer I use Lavender as a bridge note. It is not an essence I use regularly, unless it is for a specific perfume like Vera or a custom perfume. In aromatherapy synergies and blends I use it in almost every single preparation. Thanks for a nice review of Lavender, Roxanna. I do like lavender and use its calming energy when I put a couple of drops on my pillow. Lavender for me is a herb that can touch the emotions and feelings (Water element) through the intellect (Air). It can balance both. It has also something salty in the smell and much more in the taste (lavender tea). Well, it seemed appropriate to honor Lavender given all the festivals. Are there any festivals happening in your part of the globe? Yes!!! I agree with your assessment of working in both elementals, water and air. Nice observation, thank you. Thank you for your post on an omnipresent oil, but one that is the more difficult to work with the more dominant/present one wants it in a composition (at least in my hands). And there is so much artificially pumped up lavender oil out there, and synthetic bath foam things and stuff that makes us forget how good true lavender oil can be. For sure, festivals like the ones you mentioned help to raise awareness! The idea of Lavender festival is very new to me and I am fascinated with it. Yes, it's true - lavender is worth to be honored. It was nice to browse through the Sequim Lavender Festival - thank you. Andy, Omnipresent, good word choice for Lavender. I'm glad to hear I am not the only one who finds Lavender a challenge to work with in perfumery. AromaX, unfortunate the Land of Nether is too damp for Lavender, however I bet it's real green there. Here the hillsides have turned a golden brown from lack of water. "Fire" element is strong, in more ways that one. A trip to Provence for the Lavender Festivals sounds divine. I'll just hop in my private jet and head on over.